There are 16 posts filed in design (this is page 2 of 2). I’ve been remiss at updating my blog. On the day after my last post, I joined Jawbone to help lead the product design team. And today is a special day, because Dan Saffer, my former colleague from Adaptive Path, and most recently Director of Interaction Design at Smart Design, joins our growing team (in his inimitable style). One thing Jawbone groks is that “the future of wearable technology is not about wearables, it’s about analyzing the data” (Guardian article), and we’ve done some remarkable work on the UP platform in this regard, specifically around what we call Smart Coach. Whereas other tracker systems seem focused on charts, graphs, and dashboards, Smart Coach presents your life in more human ways, with natural language, and prompts and encouragement to live better. Actually, wearables is not even about the data — it’s about you. Our CEO Hosain Rahman refers to our approach to the Internet of You, where we take in all kinds of signals (from our wrist trackers and from partner’s apps and hardware), draw correlations, and provide insights and feedback across all manner of things. It’s hard work, and we’re only at the very beginning, but the promise is huge and inspiring. From a strict design perspective, this is easily the most fun I’ve had since Adaptive Path. We’re involved in interactions with hardware, software, mobile, web, watches, and more. We have to balance between hard data and engaging copy. We have to make very hard tradeoffs (battery life versus displays; battery life versus size; battery life versus sensors… you get the picture). On my third day I played with a demo that was a legitimate “Wow, this could be the future!” moment. Just last week I wrote up specs for hardware UI. In future posts, I’ll write more about my experience in designing at Jawbone. In the meantime, welcome, Dan – we’re going to have some fun! When I got the iPhone 4, I would turn it over in my hand, studying it. It was a remarkable work of design and engineering, an ecstatic product unlike anything out there, and one of the most beautiful things in my possession. I was wary of the iPhone 5, as I believed the hype about limitations of hand size guiding phone size, but found the 5 to be an improvement — in this case, more pixels were better. Having used an iPhone 6 since a week after it came out, I feel like I have a firm grasp on just what this phone is. And I don’t really like it. It’s too big. It’s awkward in the hand. My thumb can’t quite reach the upper-left-hand corner, and I’m constantly mis-tapping items up there. That Apple had to give us a hack to make it more usable should have been a sign to someone (Jony?) that however fashionable this size is, it’s still not a good idea. I’m constantly having to shift it from pocket to pocket because it doesn’t sit well in any of them. It peeks out over shirt pockets. And yes, you’re constantly afraid of bending it. And I haven’t realized any benefits from the greater screen size. Apps are in no way improved. It’s too slippery. The curved edges and aluminum back make it quite slippery. I’ve dropped it a number of times. The 4/5 had those hard edges that gave you something to grip. The 6 is just an eel. The Sleep/Wake button is in the wrong place. Recognizing that size was a problem, Apple shifted the Sleep/Wake button from the top to the side — so you could reach it with your thumb. However, given that this phone is too big/awkward already, it doesn’t matter where they put the Sleep/Wake button, because you’re already compensating for it’s size. By putting it on the side, they introduced a whole new problem. The Sleep/Wake button is now symmetrical to the Volume Up button. I typically leave my phone in my pocket while listening to podcasts. Due to the vagaries of different recording levels and ambient noise, I fiddle with volume quite a bit. (Do you see where this is going?) Now, because of symmetricality, half the time when I intend to press the volume button, I instead hit Sleep/Wake. A key principle for successful industrial design is that I don’t need to see the product to use it right — physical affordances should allow me to operate by feel. Also, if you transition between iPhone 6 and an iPad (as I do), you now find yourself feeling for the Wake/Sleep button on the side of the iPad. I guess what I don’t like is that the seemingly elegant (because of symmetry) and smart (because of hand size) move of the Sleep/Wake button makes me feel stupid because I’m often pressing the wrong button. This is a classic kind of design error that expresses itself as user error, the impetus for Don Norman to write The Design of Everyday Things. So, ultimately it’s disappointing. The iPhone 6 is the first generation that lacks perspective, personality, and the obsessive care we’ve come to associate with the product. It’s a me-too phone. It definitely has benefits over the 5s (mostly notably processor speed and camera), so, it’s not like I’m going to downgrade. 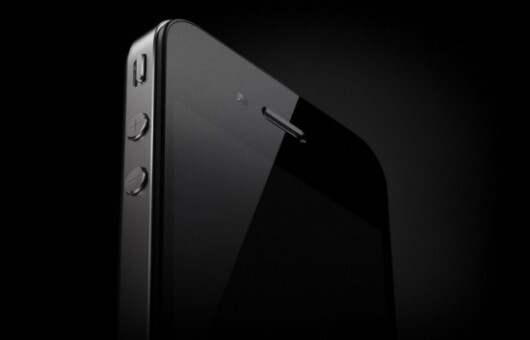 But had they simply placed the iPhone 6’s guts into an iPhone 5 shell, I would have been much happier. The fear, of course, is that this is the first step in a post-Jobs design direction, and without his tyrannically high standards, Apple once again loses its way. We’ll see. One hopes it’s simply a fashion-chasing misstep that is corrected over time (though, the market response suggests otherwise). We’ll see. In 2007, Jared Spool wrote about the market maturity framework, and how technical product categories evolve from “technology” (where it’s compelling that a product simply does a thing at all) to “features” (where there’s competition that stakes claims based on the number of capabilities) to “experience” (which delivers a gestalt greater than the sum of the parts, and often involves removing features). Most technical product organizations are still driven by engineering (“technology”) or product management (“features”). “Experience” is where design comes to the fore, but because of its nascency, design is typically subsumed into an existing engineering- or PM-driven org. The vertical orientation is primary. On the left, there’s a leadership team with a Director of Design, Director of Product, and Director of Engineering who coordinate and plan across the teams. 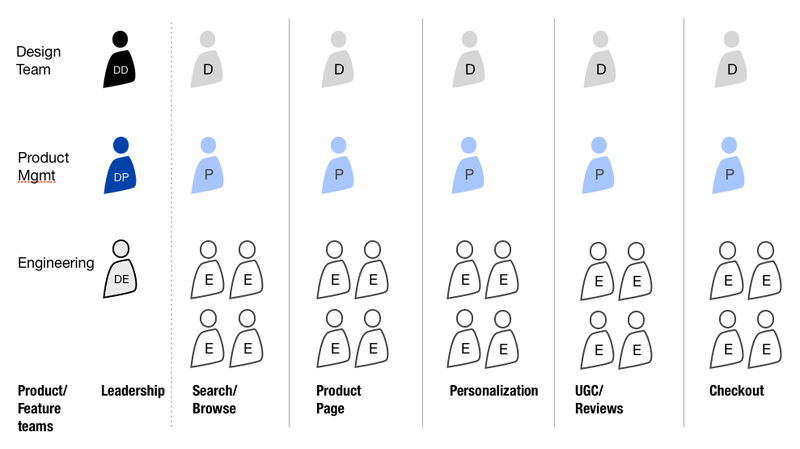 Then you have distinct “feature” teams that own different parts of the product, comprised of a product manager, a designer, and 4 (or so) engineers. The design team is distinct and works together. The Director of Design still coordinates with Director of Product and Director of Engineering, and now also with a Product Manager on a key feature team. We’ve introduced Senior Designers who own relationships with two Product Managers each. When a PM needs to know what’s going on with design, the PM talks to that senior designer. And then we have 2-3 additional designers who collaborate with the Senior Designers or Director of Design as needed. I call this a “Centralized Partnership” model, where design is centralized, but, through the senior designers, there is a real commitment and partnership with product areas. The benefit of this model is that designers can work across multiple features, ensuring coherence of the experience. However, this is still ruled by “features”. So, maybe we need to fundamentally rethink it? If companies are serious about focusing on experience, than design teams should be free to work on that holistic experience, which means that they can actually address a whole lot more. At Adaptive Path, I lead a project team on an e-commerce site. We were able to deliver across many more features, because we weren’t constrained by product teams. The open question is to figure out how product management and engineering should be structured to support this crafting of experience. But it doesn’t make sense to let legacy organization structures constrict our ability to deliver the greatest possible experience for our users. 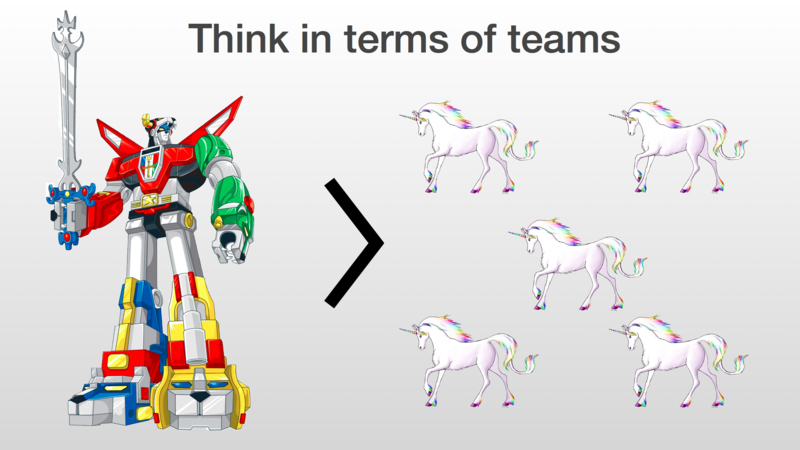 When presenting my philosophy of design organizations, I show this slide: On the left, comprised of 5 robot lions (stay with me…), you have super robot Voltron, Defender of the Universe. On the right, 5 unicorns. The unicorns refer to the “design unicorn” a designer skilled at interaction design, visual design, and front-end development. They’re “unicorns” because some believe they don’t exist, though others are betting that they are very much real. For the sake of argument, let’s say that design unicorns are real. Companies want a unicorn because she can be the lone designer on a product team, working with product managers and engineers to deliver features. On the face of it, this seems great — you get a lot of bang for your buck. However, in my experience, design is best considered at the level of a design team, and the point of the slide above is that a coordinated team of 5 designers (of varying skill sets) can out perform 5 identically-skilled unicorns working in isolation. When I joined Groupon, product designers primarily acted on their own in product teams. And what I saw is that the scope of their efforts was quite constricted. When you’re asking one person to deliver interaction design, visual design, and front-end code (or at least something prototyped), it leads to designers focusing on narrowly defined features — a single web page, or augmenting an existing flow. Among the first things I did as VP of Design was relax our requirements for product designers. They no longer needed to be technically savvy, and, they could have an emphasis in interaction design and IA or in visual design. And much of my own initial effort was on hiring strong design leads — directors and senior managers. This turned out to be key. About 9 months into my tenure, I organized the 40-plus person Design Union (what we called the whole design team) into a series of teams, each with a lead. This proved transformative not just for design, but the for the company. With these teams in place we could deliver on larger scale efforts like Groupon’s first-ever website redesign (a prior effort, before I had joined, had failed), or DealBuilder, a self-service tool for merchants to launch a deal. Another short-coming of focusing on design unicorns is that it reduces design to an execution function (I’ve written about definition and execution in my post and presentation on The Double Diamond.) 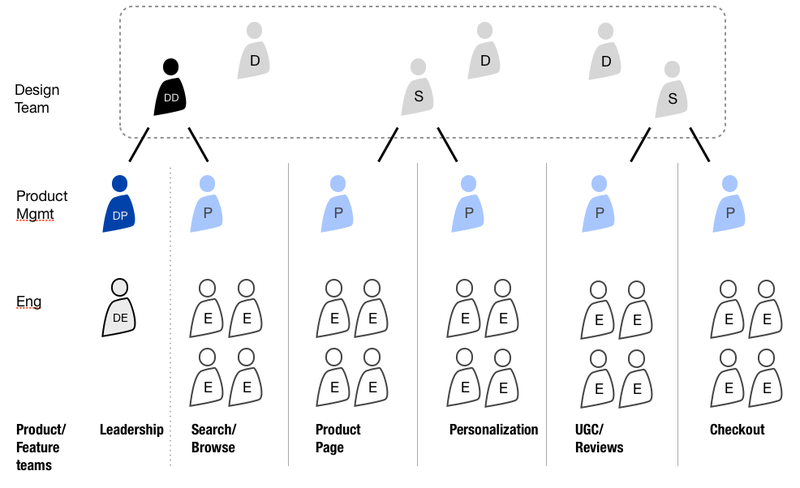 Approaching design from the orientation of teams, with strong team leadership, not only allows designers to tackle broader problems, it also enables them to move “upstream” into the decision-making behind product definition. 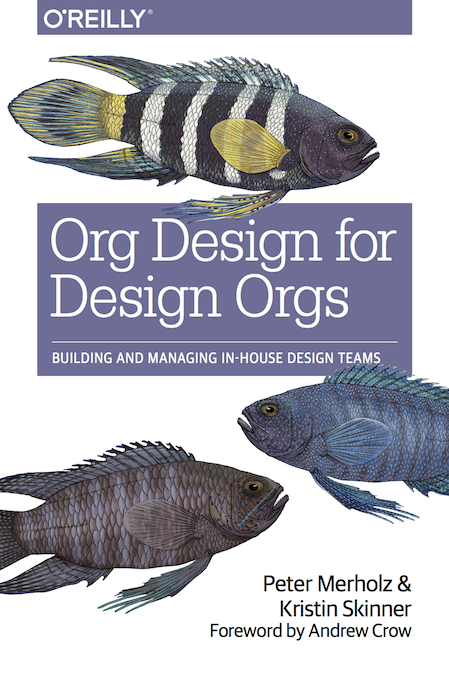 Through experience, I’ve arrived at a sense of what seems to work for the structure of design teams (again, these are teams within a larger design organization, not the whole organization itself!). Teams should have 4-7 members. Any larger than that, and team coordination gets unwieldy. Pivoting between detailed delivery within your team, coordination with peers in product, engineering, and marketing, and communication to executives can induce a kind of whiplash that not everyone can handle (in fact, I would say it’s rarer than the ‘design unicorn’). But if you find folks who can handle this successfully, your design organization can be surprisingly effective. There’s an alchemy that happens with great design teams, where the whole is greater than the sum of the parts. My understaffed teams were able to deliver far more than could have been reasonably expected because they could leverage their team-ness for greater effectiveness. Something that I’ve realized is that the ideal level of scope for a design team is different than that of a product and engineering team, and designers are currently constrained by working within an organization optimized for the latter. When I have time (and after I do some doodling), I want to talk about bridging that gap.